Click here to enlarge (458KB). 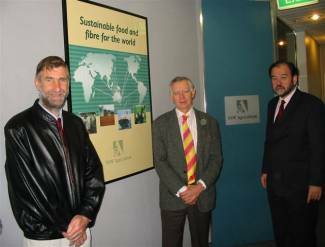 Pictured from the left: Mr Lou Revelant and Mr Jim Murison, Managers, Agsell - NSW Department of Agriculture, and Mr Michael Jones, President ACCCI, at the Agsell Office in Sydney. All three gave papers at the First Australia China Agricultural Forum in Wuhan, Hubei Province, China in November 2002 and are scheduled to participate in the Second Australia China Agricultural Forum to be held in Sydney in late October 2003. Click here to enlarge (152KB). Pictured from the left: Mr Michael Jones, Mr Han Zhong Xue, Vice Governor of Hubei Province and Ms Helen Qiao. 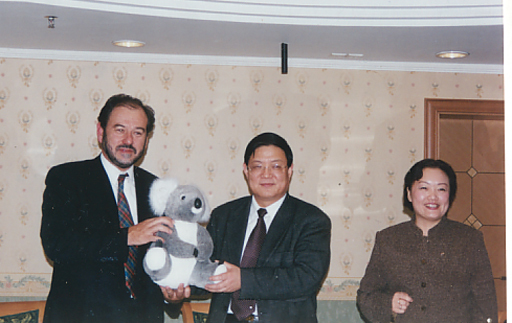 The occasion was a meeting in Wuhan on 25 January 2003 to discuss, among other things, agricultural co-operation between Australia and China. Requests for a copy of the presentations on CD-ROM may be placed with Ms Helen Qiao (Tel:). Further information about the presentations may be requested from Jim Murison, at Agsell (Tel: 9372 0126). More presentations from Australian and Chinese delegates will be listed here when they become available.